#EverySchool – #EverySchool in NYC needs to be protected by a speed safety camera. #EverySchool in NYC needs to be protected by a speed safety camera. Speeding is the #1 cause of traffic fatalities in New York. Download these infographics, or use the buttons below to post the message to Facebook and Twitter. They’ll include an automatic link back to the #EverySchool petition, so your friends can get involved too. Cameras are limited to 140 school zones in NYC. Speed safety cameras are fair. 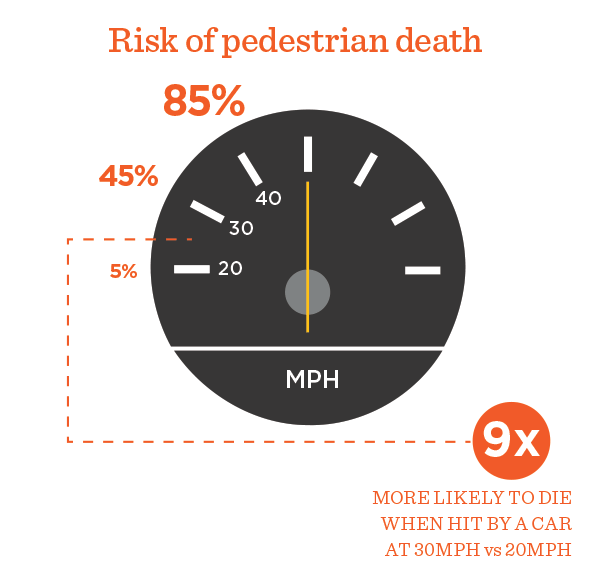 Speeding kills more New Yorkers than drunk drivers and drivers on cell phones combined. Explain what it’s like for your child to get to school. Add your personal story and your voice could have a big effect on state legislators who are debating speed safety cameras and the #EverySchool Campaign. “My son is a student at M.S. 51, on often-dangerous Fifth Avenue in Park Slope. He gets to school around 8:30 in the morning, heads out to the neighborhood for lunch release mid-day, and leaves school sometimes as late as 6 pm. When he’s outside of the school building, regardless of time of day, he sees drivers speeding on Fifth and not driving safely, and I feel his life’s in danger. “When you are a kid growing up in New York City, you learn the rules of the street, and you follow them. But as my very wise teenager says, no matter how much you follow the rules, when you are walking across the street, your life is in someone else’s hands, and most of those hands are on the steering wheel of a car. When drivers are speeding, they aren’t following the rules, and when rules are broken, people get hurt. Especially the people walking across the street. Speeding violations have dropped 50% on average where speed safety cameras are installed. There is nothing more important than your child’s and students’ safety. Right now, more than 1 million New York City schoolkids are at heightened risk. Traffic crashes are a leading cause of injury-related death for children in New York City, but less than 10% of New York City schools are protected by speed safety cameras. 1. For teachers, PTA leaders, and student organizers, Families for Safe Streets has developed a student letter-writing and social media engagement kit, that also helps teach students about New York State government, how legislation is passed and traffic violence. 2. If you haven’t already, send a message to your state legislators asking them to support speed safety cameras for every New York City school. 3. Send an email to other parents or print out this paper petition. Mail any completed petitions to: Transportation Alternatives, 111 John Street, Suite 260, New York, NY 10038 and we’ll make sure the message gets to legislators. 4. Ask your PTA, daycare, church, synagogue, or mosque to sign on to the #EverySchool Coalition. Pledge your organization’s support, or find informational materials to share with other parents. 5. Tell your story. Testimonials from parents about dangerous speeding are very important. Right now, over 1 million NYC students are not protected by speed safety cameras. 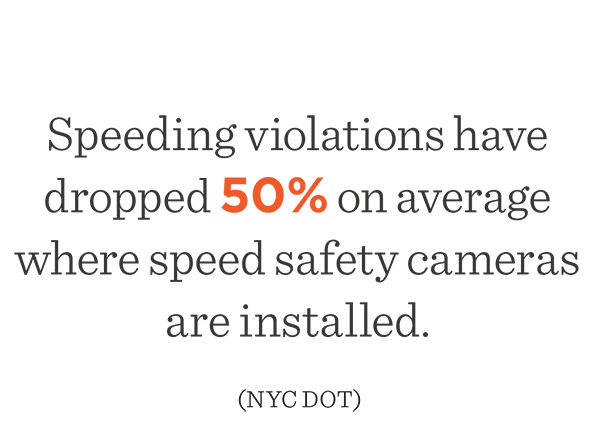 How does NYC’s speed safety camera program work? What does the #EverySchool campaign want? Aren’t speed cameras just a source of revenue for the city? Which schools can have cameras? Why not announce camera locations? Can a speed safety camera ticket cause higher insurance payments or points on my driver’s license? Do speed safety cameras photograph every vehicle that passes by them? What if a ticket is issued erroneously? What if I wasn’t driving my car when the violation occurred? Aren’t speed safety cameras unfair? We don’t need more surveillance cameras in the city – don’t cameras add to this problem? How does New York City’s current speed safety camera program work? NYC’s speed safety camera program is administered by the NYC Department of Transportation (not the NYPD). It uses the same radar and laser technology relied upon by law enforcement to measure a vehicle’s speed. Only if a laser-radar finds that a vehicle is exceeding the speed limit by more than ten miles per hour will it take images of the vehicle and the license plate. Images of the driver are not captured. The violation is reviewed by a trained DOT staff technician. If the technician verifies that the identified vehicle was exceeding the speed limit by more than ten miles per hour, a ticket will be issued, provided that the speeding occurred within a school speed zone on a school day while a school speed limit was in effect (typically between 7AM and 6PM). Under current state law, NYC can have cameras at a maximum of 140 school locations, so-called “school speed zones.” About two-thirds of cameras are fixed and remain in place, while about one-third are mobile and are moved between school zones. At any given time cameras are in operation at no more than 140 school zones. Backed by the Every School Coalition, including Transportation Alternatives and Families for Safe Streets, and thousands of parents, we are asking for speed safety cameras by as many schools as possible in New York City where speeding and crashes occur. We currently back state legislation (S6046-C/A7798-C) that would allow speed safety cameras to operate in 290 school zones in New York City (up from the current 140) at a quarter mile from each such school, and would extend the program through 2022. Additionally, the legislation would prohibit cameras within 300 feet of a highway exit ramp, and would require signage within 300 feet of a camera to alert approaching drivers. Speed safety cameras are installed to deter dangerous speeding by drivers. The only goal is to reduce injuries and fatalities. 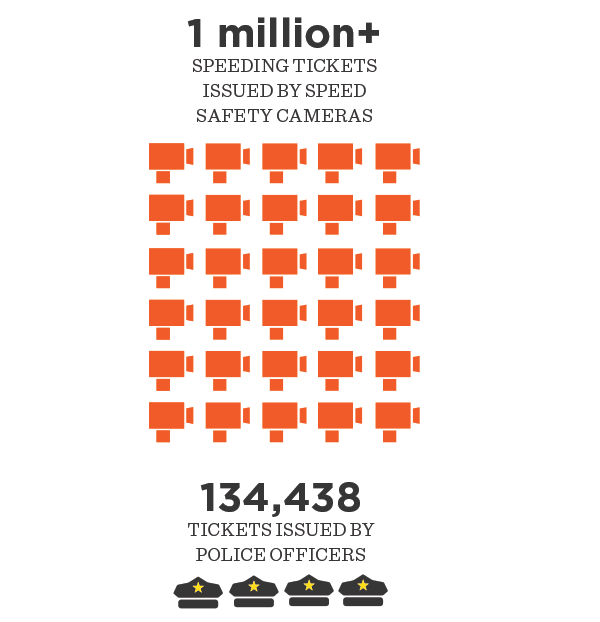 Tickets from speed safety cameras generate revenue, just like tickets issued by NYPD and parking officers for speeding and illegal parking. In cities where cameras are used, including New York City, the revenue goes down over time because speeding goes down – with each camera issuing fewer tickets when drivers moderate their dangerous driving. The goal is to reach zero dollars in revenue as drivers stop speeding, not to make money. This is why New York City does not tie revenue from cameras to specific budget items. Camera tickets are $50, compared to over $200 in other cities and $190 when a cyclist runs a red light in NYC. Failure to pick up canine waste carries a $250 fine in NYC. Currently, speed safety cameras can be placed near just 140 of any K-12 school in New York City, including public, charter, private and parochial schools. 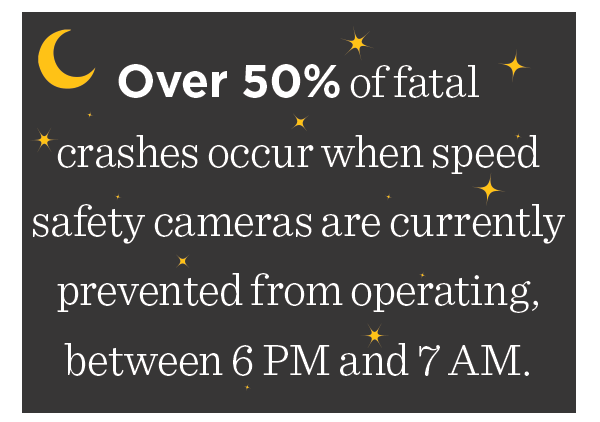 Current state law allows no more than 7% of K-12 schools to have speed safety cameras. Citywide, there are 1,835 public and charter schools and 811 private and parochial schools. The city’s speed safety camera program allows cameras in so-called “school speed zones”, defined as a ¼ mile stretch of road abutting a school. Since some schools share facilities and others are located in close proximity, we estimate the city has at least 2,000 schools in at least 1,400 school speed zones. Though it is illegal to exceed the speed limit anywhere in the City of New York, the number of speed safety cameras in operation is limited to 140, protecting only a small percentage of New York City’s school zones. To help these few cameras discourage widespread speeding, camera locations are generally not announced. 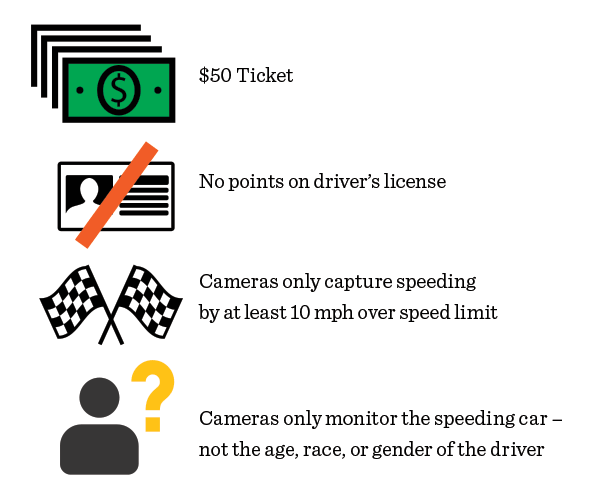 Can a speed safety camera ticket cause higher insurance payments or points on a driver’s license? No. Unlike a speeding ticket issued by a police officer, speed safety camera tickets are not used by insurance companies, nor do they incur points on the driver’s license. No. Speed safety cameras only photograph vehicles that exceed the speed limit by more than 10 mph within a school zone during school hours. What if a speed safety camera issues a ticket erroneously? Cameras are only triggered when the speed limit is exceeded. Equipment is evaluated regularly to ensure radar is collecting precise and accurate measurements. The camera technology is capable of distinguishing between speeding vehicles and other, nearby vehicles, and gives drivers the benefit of the doubt, declining to issue a ticket if it is unclear which vehicle is exceeding the speed limit. Technicians who review speed camera violations do the same, rejecting all tickets where it is not readily evident which vehicle exceeded the speed limit. What if someone else was driving my car when the violation occurred? New York State law requires vehicle owners to be responsible for speed safety camera tickets. If your vehicle was stolen, you may provide a police report to contest the $50 fine. No. Drivers are only ticketed when they speed by at least 10 mph over the speed limit, and only asked to pay $50 civil fine, far less than the fine for speeding when the ticket is issued by a police officer which can exceed $500. For comparison, a bicyclist is ticketed $190 for running a red light and can risk being sent to jail for riding on the sidewalk. Tickets given by speed safety cameras do not put points on the driver’s license, unlike tickets issued by police officers. Plus, speed safety cameras only monitor the speeding car, not the driver’s age, race or gender. Speed safety cameras are not the problem. The NYPD operates more than 8,000 surveillance cameras throughout the city, every day, monitoring sidewalks, roads and other locations. Additionally, there are tens of thousands closed circuit cameras in stores, capturing images on both private and public property. Those cameras tend to record all the time and also lack the robust privacy protections of the speed camera program. In stark contrast, there are currently just over 200 speed safety cameras (at 140 locations). With an expansion there would still be just a fraction compared to other cameras. Additionally, speed cameras only record an image when a laser detects that a vehicle on a road exceeds the speed limit by more than 10 mph, otherwise it doesn’t record or capture any images. Finally, the images captured by speed safety cameras do not capture any personal identifying features. Speed safety cameras caught over 1 million speeders in 2015. NYPD officers caught less than 135,000. Parent groups and community organizations are standing up to protect kids against speeding. If your organization believes that New York City kids should be protected from speeding drivers, you can join the #EverySchool Coalition. Manhattan District Attorney Cy Vance Jr.
Cyprus Hill Local Development Corp. Prospect Lefferts Gardens Neighborhood Assn. West Side Federation of Community and Block Assos. Word Of Life International, Inc.
Williamsburg Northside Schools Parents Assn. New York City is on pace to lose as many children in traffic crashes in 2018 as in the prior two years combined. On behalf of the EverySchool coalition, we urge you to help ensure enactment of state legislation that will help bring the life-saving protection of speed safety cameras to more New York City students and schools – improving an already successful speed camera program. Last year, the Assembly passed A7798-B. This year, we need both Senate and Assembly passage. Between 2010 and 2014 more than 16,000 people were either killed or severely injured in traffic on NYC streets. Speeding kills more New Yorkers than drunk driving and cell phone use combined, while motor vehicles remain a leading cause of injury-related death for our children. In recognition of this tragic trend, you and your colleagues first authorized speed enforcement cameras for 20 school zones in NYC as a demonstration program in 2013. Because of its success, in 2014 you expanded the program to 140 school zones in the city. 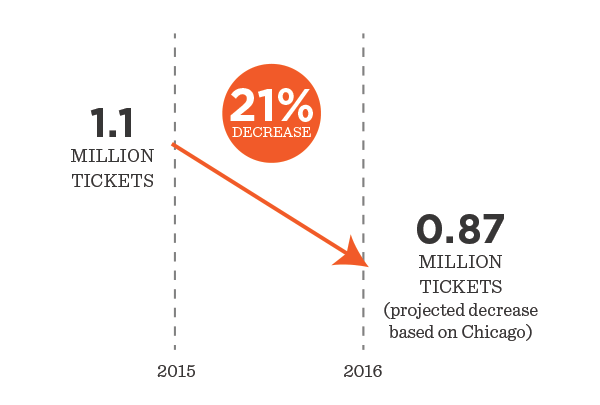 The existing limited program has been overwhelmingly effective: Speeding violations have dropped 63% and pedestrian crash-injuries are down more than 23% in locations with speed safety cameras. 81% of vehicle owners ticketed in school zones do not receive a second violation at the same location within at least two years. Yet today, despite the program’s effectiveness, under state law cameras are prevented from operating at the times and locations where 85% of traffic fatalities and severe injuries occur: Cameras are only allowed to operate at 140 school zones even though there are more than 2,000 schools – preventing more than 90% of New York City’s schools the life-saving benefits of speed safety cameras, and forcing the DOT to ration this proven vaccine to select neighborhoods. Please support this legislation to protect more New York students and communities. The few speed safety cameras already in operation are making major safety gains, reducing injury-crashes, preserving police resources and avoiding dangerous police traffic stops. Vehicle owners are ticketed just $50 and only when the speed limit is exceeded by more than 10 mph during school hours. Drivers do not receive points on their license, cameras only capture the vehicle – they do not monitor the race, age or gender of the driver; and dangerous high-speed police vehicle pursuits are avoided – to the benefit of all road users. The proposed legislation would allow speed safety cameras to operate in significantly more NYC school zones than the current 140 allowed, it would allow cameras to operate a quarter mile from each such school, and would extend the program to prevent it from expiring in 2018. Additionally, the legislation would prohibit cameras within 300 feet of a highway exit ramp, and would require signage within 300 feet of a school location to alert drivers of upcoming cameras. Last year, the Assembly passed A7798-B. This year, we need both Senate and Assembly passage! Please stand up for NYC students and prevent rationing cameras to just 140 school zones of this effective and fair technology – a proven vaccine to the lethal epidemic of speeding. Please help enact speed safety camera legislation for NYC students this session!